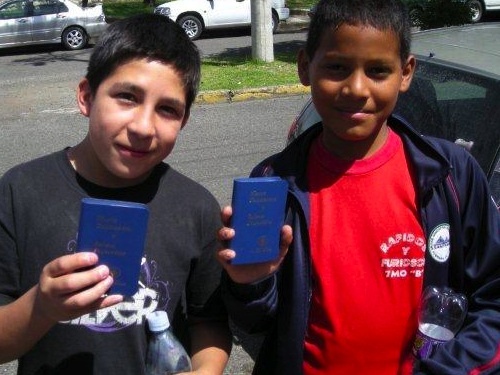 Each year, The Gideons International conducts International Scripture Blitzes (ISB) in countries to assist local Gideons in distributing God’s Word. These men participate in long days of continuously distributing and placing Scriptures. The one week International Scripture Blitz in Ecuador just concluded Friday, January 21st. During that week, over 55,000 Scriptures were placed by a team of 10 International Gideons and a local team of 30 to 40 Gideons. Below is the praise report from team members following the second day of distributions. If I recall correctly, most “letters from the road” usually state something like “we are starting to get settled in” or the like. I respectfully report that we are not settled in whatsoever, but are fully accelerating, led by the local Gideons, to place God’s Word in multiple locations around this beautiful city. Our local brothers are tireless, in a way that could only come from the Lord, in their efforts to accomplish the goal of reaching each and every distribution point. The prayers for holding the rain back have been successful. However, the sun at the equator is strong, so it has been warm, even for our local Gideons. But most importantly, this has also made it possible to do the distributions without getting wet or the Scriptures wet and have maximum numbers of youth outside. So, all in all, we are getting what we need to accomplish God’s work! Now for the real blessing – today we had numerous distributions where the middle and high school aged kids could not wait to get their hands on a Testament. We have also had several occasions for classroom distributions, and one chance for a lengthy testimony in class for the Lord Jesus since our last report. It is like the last 36 hours has had the youth have their spirits touched to have a Scripture. Keep praying! Each of us has seen specific answers to prayers, great and small. I could write for hours on how God made a way for something to happen that only He could provide. Brief examples – A Christian mother at a school at the right time today, a college student returning to pick up a Scripture after saying no once, and several instances of open doors and time to share the Gospel to people as best we can using the Testaments, helps, and short plan of salvation. We have some distributions with Auxiliary tomorrow, along with some more schools. We also plan to work the hospitals as well. Rather than spend a lot of words, let a few pictures show you what is happening here, and continue to pray for the team, open doors, the souls receiving Scriptures and that those receiving Scriptures may read and accept Christ as their Savior. We remember the ISB team in the Philippines in prayer, and we remember you all in our prayers as well. Praise God for this report. It demontrates that God will move heaven and earth that people can get the Good News of Jesus. Fellow Gideons – keep the men on ISB in your prayers. I remember the Philippines ISB of 2007; we were protected from the rain on a daily basis. I could see and feel the results of the prayers from the USA. A great blessings. I have fond memories of atteding the Blitz there in Ecaudor in 2007. I shall never forget the blessings enjoyed and how God worked in peoples lives. To God be the glory for it all. This is AWESOME news I will keep all of you in my prayers and let my brothers at the Henderson camp know about all the great work being done for GOD, KEEP UP THE GOOD WORK. GOD BLESS YOU ALL.